It's hard to understand why your dog suddenly becomes hostile, especially if he heretofore has been friendly. His anger may be directed at his owner, strange people or other animals. Given many triggers for canine aggression, you need to identify the cause before you can develop a solution. NOTE: This article references "Dominance Theory." This is a widely debated topic among dog behaviorists, and we at Cuteness like to give voice to writers on both sides of the debate. For an opposing view, please see our article Social Heirarchy Among Dogs. Fear is easy to understand. It can bring out the worst in both people and pets. Your dog will use every tool at his disposal to protect himself when he feels threatened, including barking and biting. Remember that it is about what your dog thinks, not necessarily about reality. A sudden gesture can be seen as hostile, even if it has nothing to do with your pet. Common triggers of fear aggression include attempting to take something the dog values, reaching or bending over his body, holding eye contact or attempting to forcibly move him, the UC Davis School of Veterinary Medicine notes. Dogs are all about boundaries. They do not tolerate intrusions and they will fight to defend their space. It is part of their nature and it is practically impossible to completely condition this out of them. 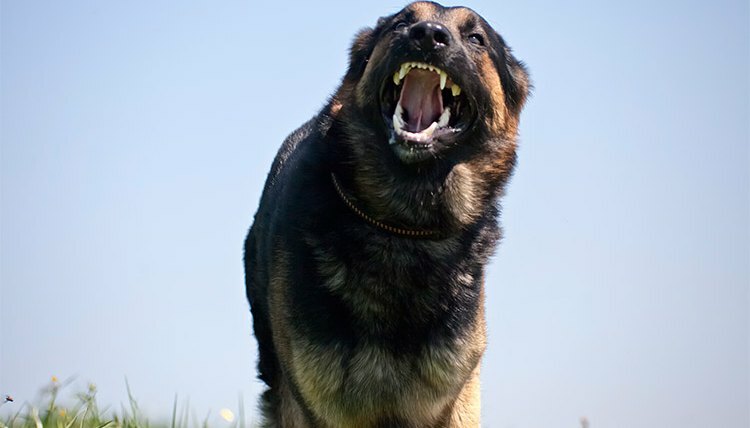 While not all dogs respond violently to strange people or other animals, you should always be ready for them to react. Keep your dog confined behind a tall fence or attach him to a secure leash every time he goes outside. Territorial aggression may also apply to you. Your dog may attack other people if he thinks they might hurt you or your family. If a stranger is talking in a loud or angry voice, or if he makes a seemingly threatening gesture towards you, then your pet may bite to protect his "pack." Dogs that live in the same household usually see each other as pack members, but that doesn't mean they won't fight. Wild canines establish dominance by fighting with one another. Domesticated dogs carry the same instinct. Hostility should die down once the order is established, but your dog will always be wary of challenges to his authority. Holding your dog, occupying one of his favorite spots, disturbing his sleep or interfering with him while he eats are all common triggers of dominance-related aggression. If your dog is particularly aggressive during meal times, separate him from all other people and animals when you feed him. Dogs are unique individuals just as people are. They remember what's happened to them and they can develop psychological problems. If they were abused or injured by something or someone in their life, they may react violently when presented with the stimulus again. There's no way to really predict these triggers, but once you notice that a certain stimulus aggravates your pet, avoid exposing him to it. Redirected aggression can also make your pet suddenly hostile. This type of aggression happens when your dog can't get to the actual source of his anger, like a dog he sees through a window, or if someone interferes in a fight between him and another dog.